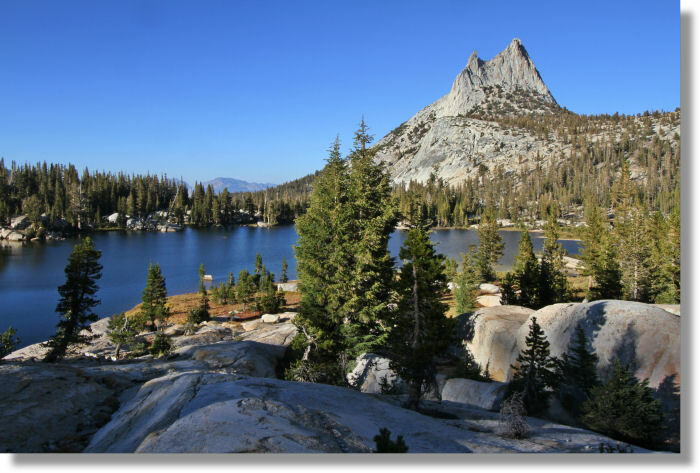 It will probably strike you as fitting that Cathedral Peak is a geological feature known as a nunatak; alas, though, a nunatak is not what it sounds like. It's actually an Inuit word of Greenlandic origin indicating a block of rock that pokes up above a glacier (in this case, from the Tioga glaciation period of roughly 20,000 years ago), and instead of getting smoothed and rounded by the ice like the rocks in the foreground, gets sharper and pointier as the glacier grinds away the supporting rock underneath. If you get your rocks off on geological nuggets like this one, check out Geology Underfoot in Yosemite National Park , a layman-readable guide to Yosemite geology.